Dr. Chad Winterfeldt, newly appointed Cantor at Christ Chapel, Gustavus Adolphus College, will present a recital of works for pipe organ at 7:30 p.m., Sunday, September 14 in Christ Chapel on the Gustavus campus, 800 W. College Ave, Saint Peter, Minnesota. 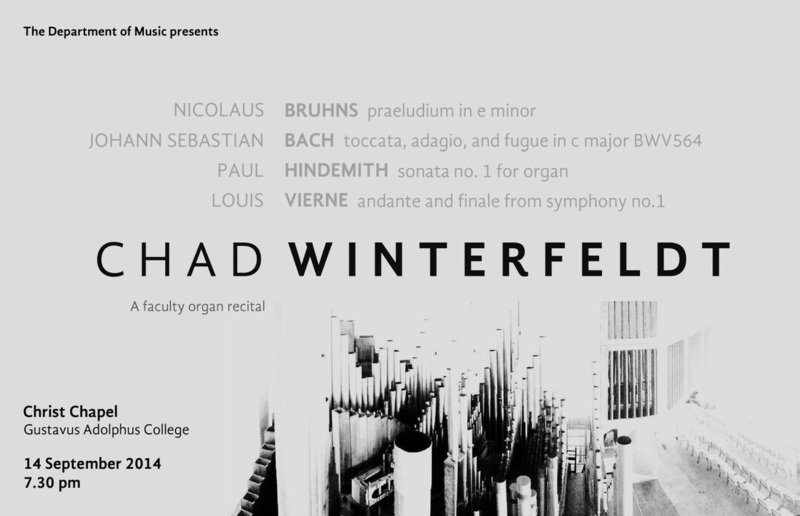 The program includes Praeludium in E minor by Nicholas Bruhns, Toccata, Adagio, and Fugue in C major, BWV 564 by J.S. Bach, Sonata No. 1 for Organ by Paul Hindemith, and two movements from Symphony No. 1 by Louis Vierne. The recital is free and open to all. Visit gustavus.edu/finearts for more information.